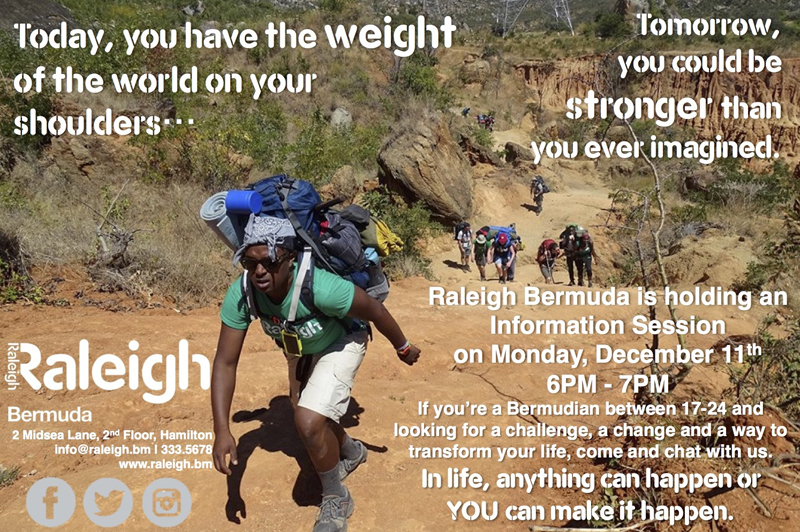 Raleigh Bermuda is recruiting for their 2018 programme, and will be holding an Information Session on Monday, December 11th from 6pm to 7pm at their office at 2 Midsea Lane. “Raleigh Bermuda [Registered Charity #710] is a youth development organisation that delivers a transformational life programme. Our programme specifically targets young Bermudians who are ‘at a crossroads’, including those who are at risk of not reaching their full potential,” a spokesperson said. “Our structure and philosophy are that of our decades-old affiliate Raleigh U.K., and are designed to help Young People develop skills and self-confidence in a fun and challenging environment beyond the classroom and workplace. “We believe that pushing a young person outside of their comfort zone allows them to explore a different side of themselves and accomplish more than they ever thought possible.